27/09/2013This entry was posted in Travel News and tagged eurostar direct service to amsterdam, eurostar london to amsterdam on 27th September 2013 by Andy Mossack. Eurostar has announced it has signed an agreement with the Dutch railways to launch direct services between London and Amsterdam from December 2016. The announcement was made this afternoon by the Secretary of State for infrastructure and the environment as part of a package of measures to enhance the services on the Dutch high speed line and will be ratified by the Dutch Parliament over the coming months. The Eurostar service will feature its new e320 trains which will be interoperable and will be compatible with the Dutch high-speed signalling systems. Since becoming a standalone corporate entity in September 2010, Eurostar has had clear ambitions to expand its business beyond its existing destinations and to encourage passengers to choose high speed rail over plane for short haul European travel. In the last year, the business has introduced new services to the Swiss Alps and Provence in the South of France. Today’s announcement represents a significant step forward in its expansion plans. The London–Amsterdam route is the largest, international airline market in Europe attracting over 3 million business and leisure passengers. With the arrival of a direct high-speed rail service between the UK and the Netherlands, passengers can look forward to an attractive, convenient alternative to the airlines. Eurostar plans to run two services a day between London and Amsterdam with journey times of around four hours. These services will run via Brussels to Amsterdam stopping at Antwerp, Rotterdam, Schiphol Airport and Amsterdam Centraal. 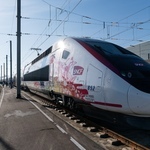 In addition to providing a direct high-speed link between the UK and the Netherlands, this service will also enhance the scope for customers to connect to a range of destinations in mainland Europe.